Joe Bertolino outlined his vision Friday for Southern – a vision that establishes the university as the regional higher education institution of choice for students and community partners. 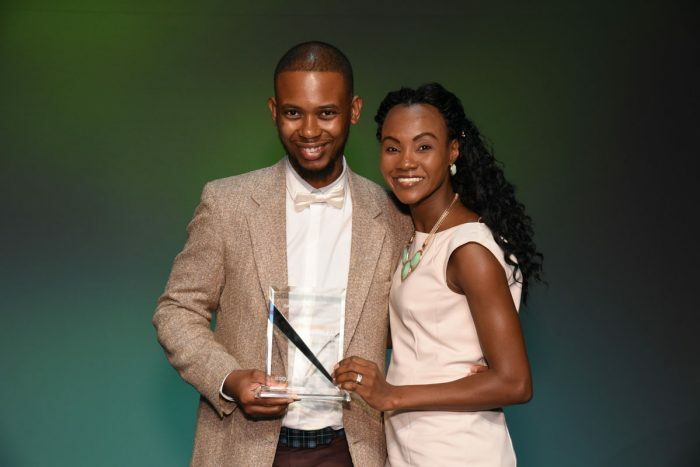 At the same time, he wants to help foster a university culture that promotes respect, compassion and kindness; where members of the campus community care about one another personally and professionally; and from which Southern becomes a statewide leader for social justice. 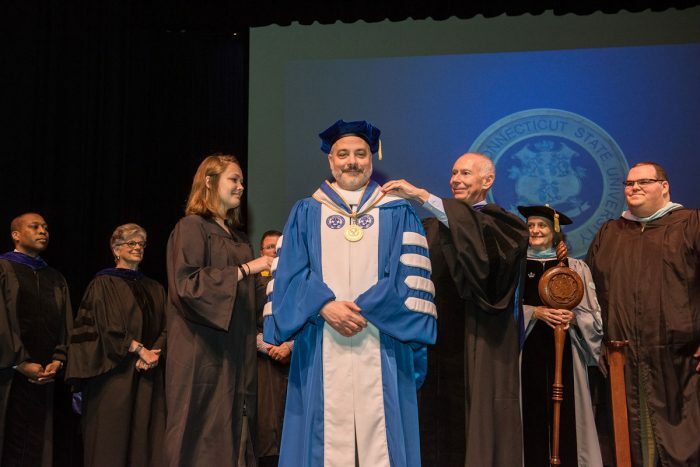 Bertolino discussed his vision during an inauguration ceremony at SCSU’s Lyman Center for the Performing Arts, where he took the oath of office as the school’s 12th president. 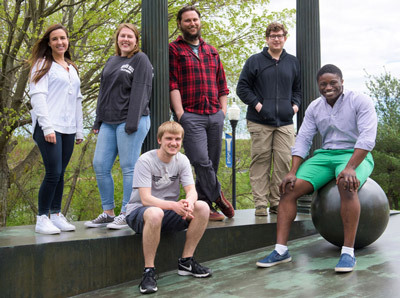 “At Southern, as many of you know, our students are drawn from all types of backgrounds – racial, ethnic, religious, gender and economic,” Bertolino said. “Many have had to overcome life’s obstacles to reach their goal: working jobs while studying, supporting children or elderly relatives; taking those initial, uncertain steps into higher education as the first in their families to attend college. Bertolino, 53, began his duties as president last August after being selected by the state Board of Regents for Higher Education. He previously served as president of Lyndon State College in Lyndonville, Vt. He already has immersed himself in projects designed to enhance SCSU’s profile; boost enrollment and graduation rates; streamline the transition process to Southern for students; and bolster community partnerships. Bertolino succeeds Mary A. Papazian, who left SCSU last summer to become president of San Jose State University in California. Speakers at the ceremony included Mark Ojakian, president of the Connecticut State Colleges and University system; Lawrence DeNardis, a member of the state Board of Regents for Higher Education; Ugo Eze, a former student of Bertolino, and Patricia Cormier, president emeritus of Longwood University, based in Farmville, Va. Regents Merle Harris, Naomi Cohen and Scott Jackson also attended. Ojakian said that from the first interview, he could see Bertolino possessed the qualities that would make an excellent president. “I saw the passion. I saw the commitment. I saw the selflessness,” Ojakian said. In addition to being a lecturer and educator, Bertolino is the author of many articles and book chapters. He is the co-author of “Let The Games Begin, A Guide for Peer Mentors,” which was published in 2012. 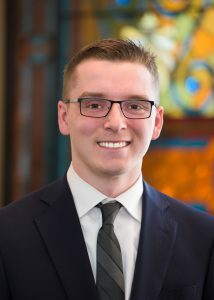 His research interests include student immigration, campus community development, campus social change, leadership development, service learning, multicultural worldviews and LGBTQ student issues. 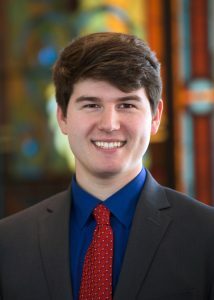 He is a member of the American Association of State Colleges & Universities, American Council on Education, New Haven Promise Board of Directors and the Central Connecticut Coast YMCA Board of Directors. Before becoming president of Lyndon State, Bertolino served as vice president for enrollment management and student affairs at Queens College/City University of New York from 2004 to 2012. He earned an Ed.D. in higher education administration and leadership development from Columbia University Teachers College in 2003. He also holds a Master of Social Work degree from Rutgers University and a Bachelor of Science degree in psychology and sociology from the University of Scranton in 1986. Southern students are bringing their expertise in the rapidly growing field of data analytics to area agencies looking to use “big data” to help grow their companies. Eight students are serving internships in a variety of fields – a local law firm, the Greater New Haven Chamber of Commerce, the Regional Water Authority and SCSU’s own Office of Assessment and Planning. In addition to the internship experience, students earn an IBM badge they can put on their resumes. Students are currently applying for the fall’s Watson Analytics Internship Program. Data analytics is a growing field used increasingly by businesses and other organizations. The experience gained by the students through the partnership with IBM and area firms will help them considerably in attaining jobs in a field that has become increasingly lucrative over the last few years. It helps find trends and behavioral patterns that might not be readily apparent by conventional analytical methods. IBM Watson Analytics does not require a person to know computer programming or coding, according to Ben-Avie, which makes its use accessible to a greater number of people. This kind of data also enables organizations to do micro-targeting in a somewhat similar manner as political operatives can micro-target voters. Using cognitive analytics, the university is now able to discern the enrollment patterns of students who are the first in their families (including siblings) to attend college and compare those patterns with those who do not have a parent or guardian who graduated with a four-year degree. He said data analytics has enabled the university to ascertain the nuances on this subject and other trends. In turn, that data can be valuable for marketing, recruitment, retention and other purposes. The partnership between Southern and IBM began about a year ago. Last summer, IBM had asked to publicize the innovative work at Southern. Ben-Avie agreed — with the condition that IBM offer a free boot camp to students. In a meeting with the Greater New Haven Chamber of Commerce after the boot camp, the idea for an internship program was born. To further publicize Southern’s use of Watson Analytics and data discoveries, Ben-Avie and Randy Messina (manager of IBM Watson Analytics, worldwide public sector) recently teamed up to organize an international webinar. Applications are now being accepted for the internship program in the fall and is open for students enrolled in any academic program. Knowledge of statistics is not required. The program is limited to 20 students. Undergraduates Coral Jiménez, Jacqueline Hernández-Flores, Teresa Wirtemburg, Shea Keeley, and Giovanna Diana presented “Cultural Competence Club–Join-Up!” The paper examined the development of Southern’s trailblazing student-led organization Cultural Competence Club, which invites cross-disciplinary involvement in learning about and engaging across cultures. 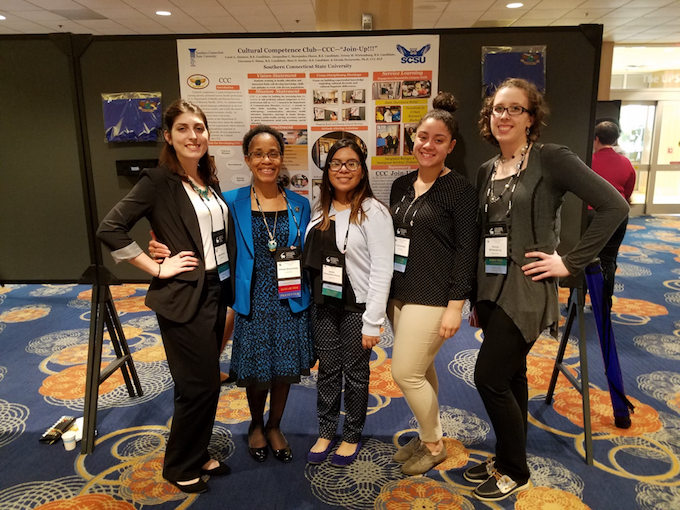 Pictured Left to Right: Shea Keeley, Glenda DeJarnette (Mentor), Jacquelin Hernández-Flores, Coral Jiménez, Teresa, Wirtemburg. 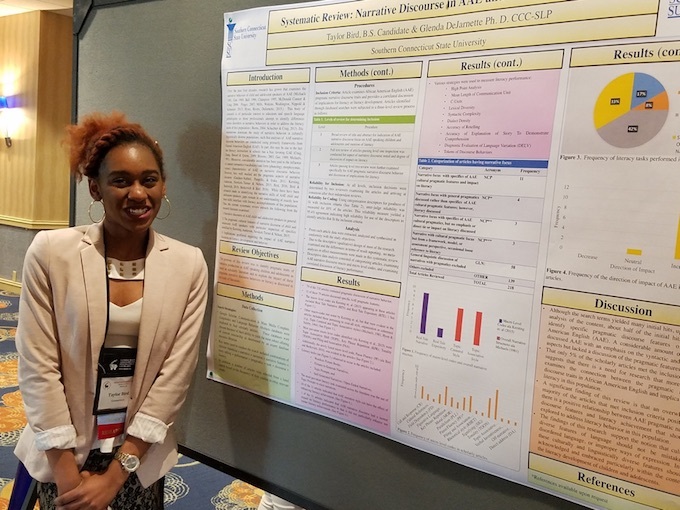 Graduating senior Taylor Bird presented “Systematic Review of African American English (AAE) Narrative Discourse: Impact on Literacy.” The paper was an extension of research Taylor conducted as a recipient of the 2016 SCSU Undergraduate Research and Creativity Grant to determine AAE narrative skills across disciplines. 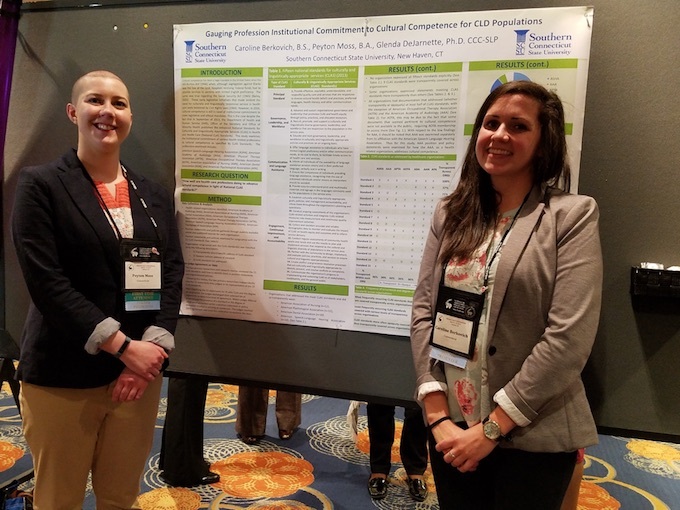 Graduate students Caroline Berkovich and Peyton Moss presented “Gauging Institutional Commitment to Cultural Competence for CLD Populations.” The research examined policies from national organizations in health-related fields regarding professional workforce preparation to address cultural diversity. The M.A. 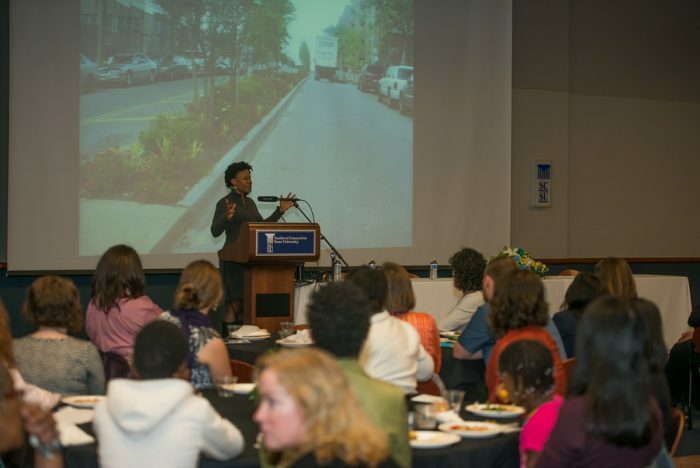 in women’s studies degree program turns 20 this year, and in celebration of this milestone, the Women’s Studies Program will hold an alumnae/i summit, “Transforming the World With a Feminist Degree and Vision,” on April 21. Co-sponsored by Women’s Studies and the SCSU School of Graduate Studies, Research, and Innovation, the summit will draw graduates of the program back to campus to discuss their experiences in the program and beyond. With the first course in women’s studies offered at Southern in 1971, it was among the first universities in the United States to offer courses in this discipline. The master’s degree program, conceived more than 20 years ago by a small group of colleagues — Director of Women’s Programs Rosalyn Amenta, History Professor Virginia Metaxas, and English Professor Vara Neverow, who continue to teach women’s studies today — was the first free-standing M.A. program in women’s studies offered by any university in the Northeast. Two decades later, it remains the only M.A. program in women’s studies offered by a public university in New England. Ms. Magazine, in its April 2012 issue, reviewed all of the women’s studies M.A. programs in the country and recognized the SCSU women’s studies master’s degree program as a “vibrant” regional program. This summit is a reunion, an honoring, and a networking opportunity, says Lin. In this gathering, by sharing the women’s studies graduates’ talents and passions, event organizers aim to showcase the activist, advocacy, policy, and scholarly work that alumnae/i have taken on in different corners of the world and the nation for the past 20 years. To register for the summit, click here. Lin explains that the registration fee is to offset the cost of the dinner program. 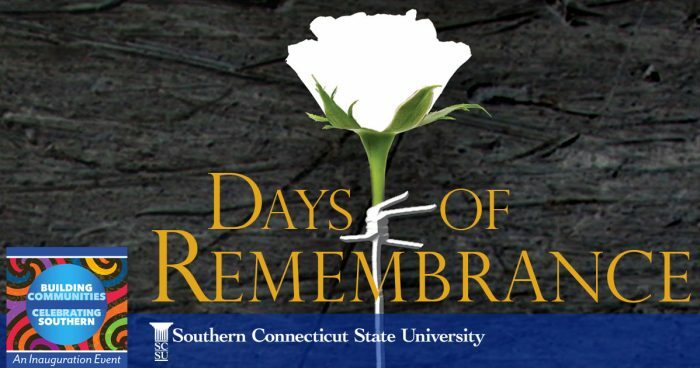 She adds, “We look forward to welcoming you each back home on April 21 and hearing all about the glorious work you are doing, engaging the world and making a difference!” For more information, call (203) 392-6133 or email WomenStudies@Southernct.edu. A Southern team is trying to improve the lives of African children who have an autism spectrum disorder. Ruth Eren, endowed chair of special education and director of the Center of Excellence on Autism Spectrum Disorders; Stephen Hegedus, dean of the School of Education; Doreen Tilt, coordinator of training for the Center; and Shaylah McQueen, a graduate student seeking a Master of Science degree in special education, recently spoke to a group of United Nations ambassadors and ministers from Africa. The meeting was hosted by Necton Mhura, U.N. ambassador from the Republic of Malawi. It came about at the request of Ugoji Adanma Eze, an international human rights lawyer who is an advocate for women and children. 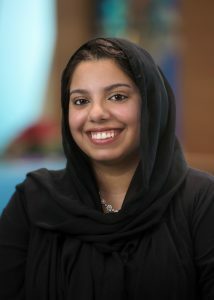 Eren said she was asked by Eze to speak at the U.N. to present educational interventions for children with autism. Eren then asked Fred Volkmar, professor of psychology at the Yale University Child Study Center and an expert on the medical side of autism, to join the SCSU contingent in their presentation at the U.N. In fact, Eze has proposed writing a book on the subject to educate the African populace, and has asked Eren to author a chapter. Hegedus served as the keynote speaker at the U.N. session, where he focused on the stigma. To emphasize the point that there is no need for those with the disorder to be stigmatized, he held up a photo of a nephew of his who has an autism spectrum disorder. Hegedus said the stigma problem is a socio-cultural issue that should be addressed not only though the schools and parents, but through the churches. “The churches play a significant role in education in Africa,” he said. Ronnie Nunn, a former longtime NBA referee and TV show host, will be the keynote speaker at this year’s Joseph Panza Sport Management Lecture at Southern. Nunn, who refereed 1,134 regular season and 73 playoff games during a 19-year career, will deliver a talk, “Making the Right Calls On and Off the Court.” The program is scheduled to begin at 10:30 a.m. April 20 at the Michael J. Adanti Student Center Theater..
Nunn refereed four NBA Finals games, as well as the 1996 NBA All-Star Game. He also had been the host of the television sports show, “Making the Call with Ronnie Nunn” on NBA TV. After retiring as a referee, he served as the NBA director of officials and director of development. A question-and-answer period will follow his speech. The event is free and open to the public. 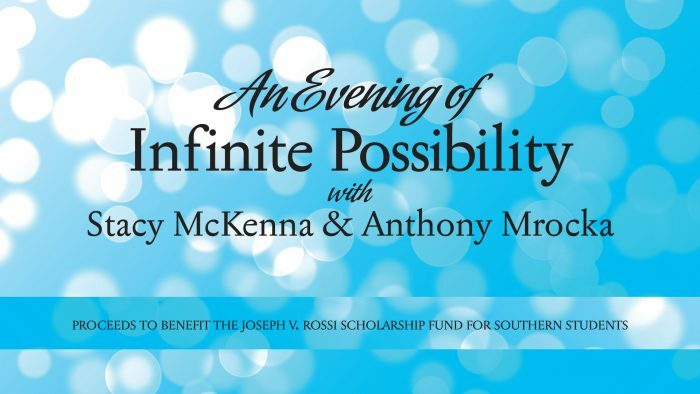 For further information, contact Kevin McGinniss at (203) 392-8837 or at mcginnissk1@southernct.edu. Four Southern students were honored recently as the 2017 recipients of the Henry Barnard Distinguished Student Award. 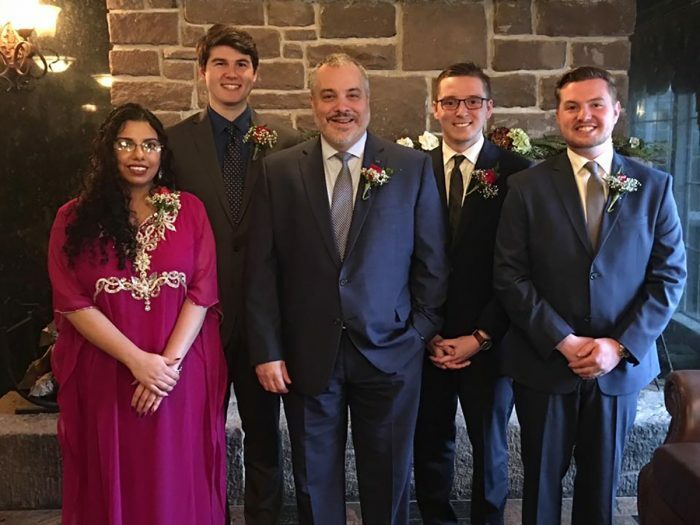 Each year, 12 students are selected for the award from the four universities in the Connecticut State Colleges and Universities system. Four of the 12 students come from Southern. Criteria include a GPA or 3.7 or better, and having demonstrated significant participation in university and/or community life. *Adam Zhitomi, a communication disorders major with a GPA of 3.71. 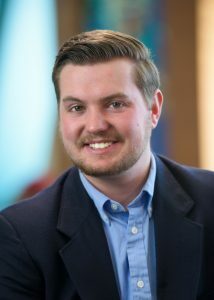 He has served on the Student Government Association Executive Board and volunteered for many activities at SCSU, including Relay for Life, Special Olympics and SCSU Day of Service. He also has been a member of the Best Buddies Executive Board, which seeks to help those with various types of disabilities. *Sadia Younas, a chemistry major with a GPA of 3.91. She has served as secretary of the New Haven chapter of the American Chemical Society and has presented posters at several undergraduate research conferences regarding cadmium concentrations in Long Island Sound. Born in Pakistan, she moved to the United States in 2002. After graduating from high school, Younas attended Middlesex Community College, before transferring to Southern. *Brandon Brush, a communication major with a GPA of 3.93. He has been a member of the Crescent Players and the National Society of Leadership and Success. He also is providing in-home support for two young adults in Hamden with an Autism Spectrum Disorder. Brush is writing and directing a pilot episode of a sitcom for his honors thesis. Nicholas Charnysh, a recreation, tourism and sport management major with a GPA of 3.8. He is vice president of the Student Government Association. He has been a basketball instructor for kindergartners and first graders with the Branford Parks and Recreation Department. He also is director of the counselor-in-training program at the YMCA Camp Sloper in Southington. Charnysh co-created the SCSU Spirit Commission in an attempt to boost school pride and is a member of the Crescent Players.